Hi everyone! Well, if you have been following me along, you know we love our family hikes! Here is us two weeks ago towards the very top of Mt. Tam on the coastal side. This is one of my very favorite hikes as the sweeping views of the ocean are breathtaking. It is also a favorite as there is not much elevational gain so you can easily walk the trails that wrap the mountain. If your up for it sans children, you can hike all the way down to Stinson Beach from the trail we are on. I wore Aura in her pretty lavender Baby Bjorn One carrier and my husband carried Tudor in our Osprey Pogo AG carrier. I just love the photo of them sitting next to each other with the ocean in the background. These photo's don't even do the panoramic views justice. I hope you can visit one day! To access the trail head you take from 101, the Panoramic Highway up Tam to Pan Toll Road, then turn on East Ridge Crest Blvd. and turn into the first dirt parking lot on the right. Park and cross the road to the trailhead. Break time! Everyone is happy to be out of the carriers and enjoying the view. Next time we bring a proper picnic. Aura's outfit if from the Gap, as well as Tudor's. I just love this fuzzy fleece on her. 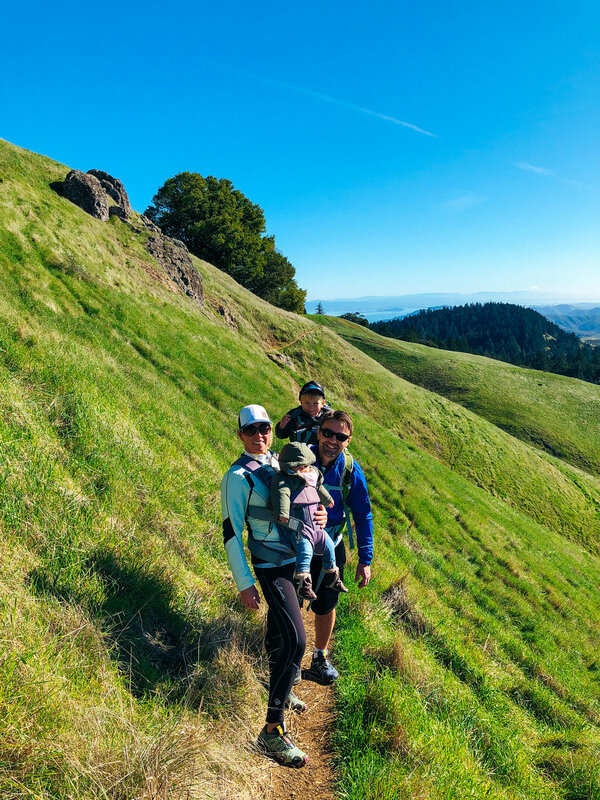 FACT: Mount Tamalpais is the highest peak in the Marin Hills, which are part of the Northern California Coast Ranges. The elevation at the West Peak, where a radar dome currently stands, is approximately 2,570 feet. FUN FACT: When driving from the North to South on 101, Mt. Tam looks like the silhouette of a lady lying down, well one with implants. What are your favorite activities to do as a family and your secret spots?